Transform a usual day in the life of your special lady into a winning one by delivering to her doors this Portion-of-Romance Blossom and Sweetmeat Collection and let the fabric of love embracing you two be illuminated all the more. This Collection displays a lively Posy of 3 stunning Red Roses and a 1/2 Kg Eggless Chocolate Cake. 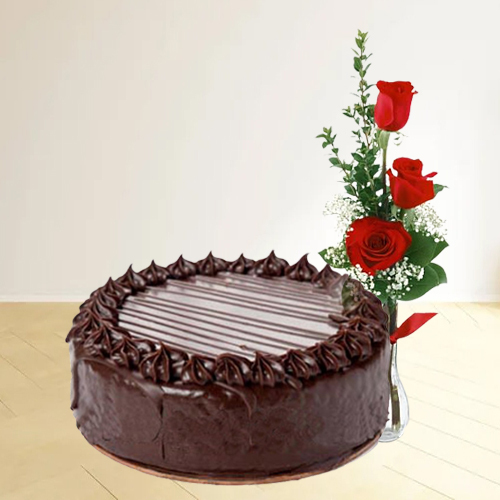 Flowers Delivery Nagari, Send sweets Hazira, Wedding Cake Bhiwadi, Diwali Mithai Mohali, Send Flowers and Gifts to Hubli, Online Shop Mumbai, Flower to Barmer, New Year Flowers Valsad , Fresh Fruits Hazira, Send Gift Nagpur, Dry Fruits to Trichy, Birthday Delivery Jhalawar, Sending to Vishakhapatnam, Flower shop Karaikal, Jamnagar Online Cake Delivery.